We’ve finally reached the point when we can safely say that there are good enough alternatives to the iPads and the Galaxy Tabs for the average Indian to buy. The best part is that many of these come from domestic companies itself. 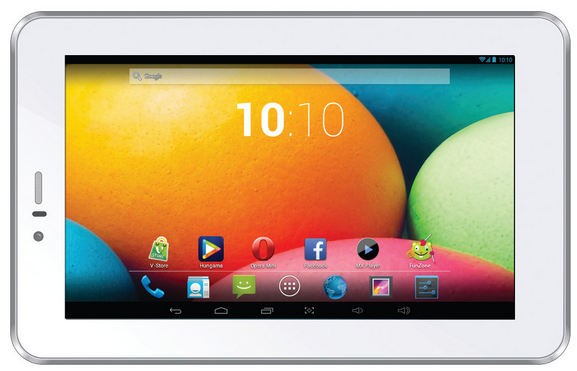 One such tablet is the 7 inch Videocon VT85C which was unveiled a few days back. The device doesn’t cost a fortune, and comes with a decently powerful processor among other specs. Let us go ahead and discuss this device in detail. Unlike most other tablets, the Videocon VT85C comes with a decent set of cameras. It packs a 5MP unit at the rear which can be the substitute to your phone’s camera when your phone is unavailable, but as you might know, the camera will not be as good as other 5MP units since emphasis is completely on the processing and display when it comes to tablets. On the front, the device features a 0.3MP shooter which you can use for video calling. You probably will be satisfied with the performance in daylight, but low-light situations might pose a quality problem. The tablet comes with a paltry 4GB of ROM on-board, which means you will have to shell out more for a memory card of your choice of capacity. The tablet features a decent 1.2GHz dual core processor. We assume this processor to be the MT6577 from MediaTek, since the tablet also comes with 3G calling and the MT6577 features an on-board 3G modem. Paired with 1GB of RAM, the tablet will be a nice device for handling your productivity apps, but gaming and multimedia might not be the best of activities to be carried out on the tablet. The battery is a slightly disappointing 3000 mAh unit, which won’t last any longer than 3-3.5 hours of screen time. If you tend/wish to use your forthcoming tablet for more than that duration, either be prepared to carry around the charger and/or a power bank, or look for other options with bigger capacity batteries. The tablet comes with a 7 inch display with a resolution of 1024 x 600 pixels, which is not very impressive. However, it will probably suffice if you are a first time tablet user, provided you don’t come from an HD smartphone. Otherwise, the display will not prove to be a very exciting one; movies and multimedia will be tough to enjoy. The tablet will come with Android v4.2 out of the box, which is about the average for today. Hopefully, Videocon won’t take long before pushing updates to newer Android versions including v4.4 KitKat. What you think about the looks is purely subjective, but we for one seem to like the sleek and refined design on the tablet. The white colour gives it a premium touch as well. The device comes with WiFi, Bluetooth, 3G, GPS, voice calling, etc. There are a few devices in the market with similar price and specifications, or both. These devices include – Swipe Halo Value+, Funbook Mini P410, Mercury mTab Star and iBall Slide 7334i. The device isn’t overly impressive, but not too bad either. The price is a little steep, meaning we would’ve liked to see the device sell for about 1,000 INR lesser. Mind you, that is still possible because there’s a high chance of price drops every now and then. The tablet per se seems like a decent choice for those who’re looking for a decent first tablet, and want 3G + voice calling features as well.